Kish and I have watched the first two episodes of Boardwalk Empire, the new HBO series. It is fabulous, and we are already fully and blissfully hooked. For those of you who haven’t seen the show, it is the story of Atlantic City in 1920, as Prohibition is just beginning. The focal point of the show is Enoch “Nucky” Thompson, an elected public servant who just happens to be the head of the Atlantic City underground. 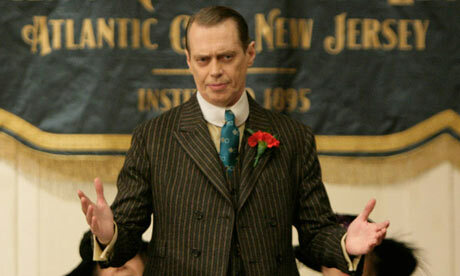 Nucky is brilliantly played by Steve Buscemi. As with so many HBO series, however, there are many other intriguing characters and historical figures who have their own subplots, including Arnold Rothstein (the gambler who fixed the 1919 World Series), a doughboy returned home from World War I who sees a life of crime as a way to make his way up in the world, an emotionally stunted IRS prohibition agent, a well-read female Irish immigrant who has been brutalized by her drunken husband, and Al Capone, among many, many others. We will happily follow the serpentine twists and turns of the plots and subplots as the season progresses. One of the things we enjoy most about HBO series is their ability to capture the mood and setting of long-gone places and times. Deadwood, with its spot-on depiction of a brand-new, mud-spattered, lawless town founded on a gold boom, is a good example. Boardwalk Empire is a worthy successor — and with Martin Scorsese directing, you would expect nothing less. The sets, costumes, and scripts do a fantastic job of recreating the era, 90 years ago, when American tried to go dry and a boom in organized crime resulted. It is one of those time periods that seems to have been lost in the shuffle, largely skipped over in American history class when the teacher went directly from World War I and the Treaty of Versailles to the stock market crash and the Great Depression, with perhaps only a brief mention of the Jazz Age and flappers. I’m looking forward to learning a bit more about what that era was really like.